American Culinary FederationContestsDo you make the best Mac-n-Cheese in Orlando? Who doesn’t love macaroni and cheese? Who doesn’t love helping a good cause? And who wouldn’t want to combine both of those things into an afternoon of fun? The 2015 O-Town MacDown is set for Saturday, September 12th, from 11 a.m. to 4 p.m. at the Osceola Heritage Park in Kissimmee, FL. Chefs are needed for the event, so if you dare to put your secret recipe up against the best Orlando has to offer, sign up now for the competition. Prizes will be awarded in various categories. The event will include live entertainment, chef cooking demonstrations, vendor booths and a kids’ fun zone. Over 1,700 mac-n-cheese fans attended the first annual O-Town MacDown. There are a limited number of entries available, so sign up early to reserve your spot. Professional Chefs & Restaurants – $100 per to enter. Includes two (2) O-Town MacDown Admissions, a 10’x10′ booth and table. Please prepare at least 500 (1-ounce) samples or more. Tasting cups, napkins and spoons will be provided. Participants should bring a platter of choice to transport their mac-n-cheese taster cups to the judges. All entry applications must be received prior to Saturday, August 1st, 2015. So sign up today at www.OTownMacDown.org. Vendor and sponsorship opportunities are available, please contact Special Events for more information at specialevents@gktw.org or 407-396-1114 xt. 4538. 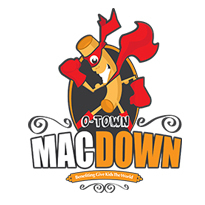 Click here to download a printable flyer and help promote this year’s O-Town MacDown!